I am the historian of science in the School of Science and Mathematics at Truman State University. I teach a two semester sequence of courses in the history of science from ancient Greece to Watson and Crick, a course in philosophy of science, a JINS course on extraterrestrial life, and, finally, organic chemistry lecture and laboratory. Go here for more information about me and my experience. My particular interest is the history of modern chemistry. In 1905, Alfred Werner, the famous inorganic chemist, declared that “Chemistry must become the astronomy of the molecular world.” Chemists have achieved Werner’s goal in a spectacular way, and they had already done it largely before Werner. I am interested in how chemists made chemistry the “astronomy of the molecular world,” and how they learned to understand the microscopic world of the atom and molecule in the nineteenth century by using only macroscopic manipulation of chemicals in the laboratory. 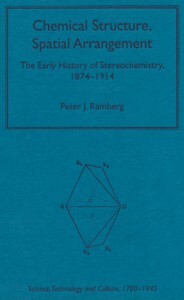 My 2003 book on the early history of stereochemistry (the last stage of nineteenth century organic chemistry) is no longer in print, but I have a few copies available for purchase. Please contact me for details at rambergattrumandotedu. My current project is a full biography of the now rather obscure nineteenth century German chemist, Johannes Wislicenus (1835-1902), who coined the term “geometrical isomerism.” No, I didn’t write the article, but I have edited it. Want to know more about history and philosophy of science? The header image above is taken from Antoine Lavoisier, Oeuvres Completes, and depicts the massive burning lens constructed for the Paris Academy of Sciences in the late eighteenth century. It was used, among other things, to create the heat necessary to burn diamonds. 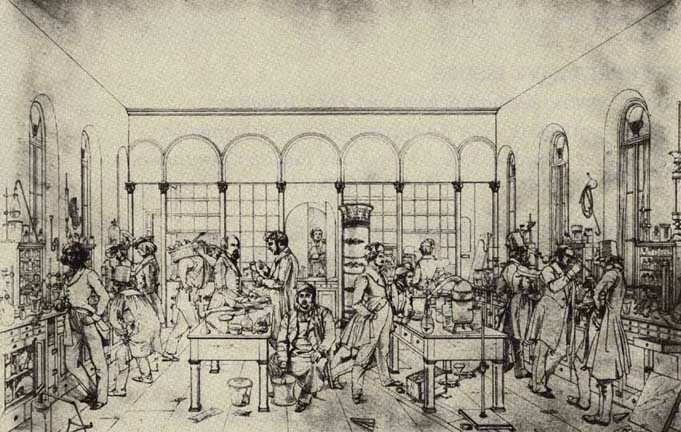 Below is a famous drawing, made around 1840, of Justus Liebig’s famous chemistry teaching-research laboratory in Giessen.